The recent algae outbreak forced a decision to move the whole fish rack again. The rack is now no longer in front of the windows. The flooding of direct sunlight and the shop light T8 tubes, even with a reduced photo period to seven hours per day, was just too much light. The photo period has been raised again to nine hours per day. There is still some residual algae on the lower part of the aquarium glass near the substrate. This can be easily managed by the addition of some Olive and Tiger nerite snails. The move caused a significant White Cloud Mountain minnow fry die-off. This was totally our fault. There was not enough water left in the tanks as we moved them. Sad about the loss of fry and will be more careful in the future. So the remaining population are all at least 1/4" to 3/4" long and there are four in the 10g:redux Shrimparium, four in the 10g:view planted tank, plus the three original parents in the 10g:view. Not bad for our first fry, especially since they were totally unplanned for. We also lost one of the three neon tetras. Not sure why, it died two days after the move. The nice surprise just after the new year was two berried American glass shrimp as we posted earlier. They have been moved to a five gallon aquarium with one male. They survived the move, seem not to have dropped any eggs, having been in the five gallon aquarium for a week now. 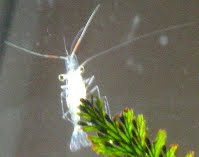 They are due to hatch shrimplets anywhere in the next week or two as best as we can figure. This is very exciting as these are the babies we actually wanted. A new camera is wending its way to us but it may be as much as two weeks before it arrives therefore; no pictures at this time.